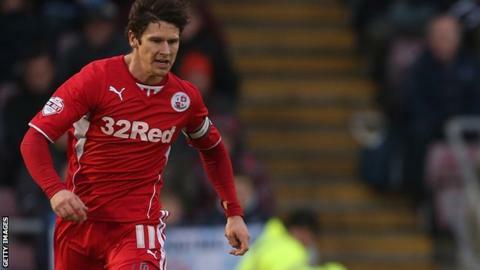 Crawley have appointed Joe Walsh as their new club captain, after transfer-listing former skipper Josh Simpson. Simpson, who has scored 13 goals in 162 appearances for the Reds, is one of five players to be made available for loan or transfer by boss John Gregory. Summer arrivals Matt Harrold, Conor Henderson, Brian Jensen and Lewis Young have also been transfer-listed. Meanwhile, funds have been made available to Gregory to strengthen his squad before the loan window closes. Crawley are currently 15th in League One, four points above the relegation zone. If the listed quintet do not depart before the loan window closes on 27 November, they will be made available for a permanent move away in January. "Whilst players have been transfer-listed the board and owners are happy to fund loan deals so that the squad can be strengthened," Crawley chief executive Michael Dunford told the club website. "Already the board and owners have committed over £800,000 this season. Like all our supporters, their wish is to see a successful team. "Even set against our reduced attendances this season, they have agreed to provide additional funds to the manager." New captain Walsh, a 21-year-old defender, has scored nine goals in 96 appearances for the West Sussex club.